The organisers of Crossing Borders have re-invited pro-Assad speaker Tim Anderson to their refugee conference due to take place on the island of Lesvos in July. Anderson’s shameful record on Syria has been detailed by journalist Andrea Glioti who documented how he abused his position to act as a propagandist for the Assad regime, providing cover for Assad’s campaign of mass murder and gross violations of human rights. When academic Maria Nikolakaki was asked by Syria Solidarity UK why Anderson had been re-invited despite his clear pro-regime stance, his links to the regime, and the opposition to his appearance from other conference speakers, her only reply was to share a petition initiated by the pro-Assad, US-based Syria Solidarity Movement protesting Anderson’s initial removal. The petition had been signed by 270 people. The fact that Anderson has been re-invited shows clearly that some of the conference organisers have some sympathy with his views. This also helps explain the complete absence of any Syrian speakers at the conference, despite Syrians making up a majority of the refugees fleeing to Europe. 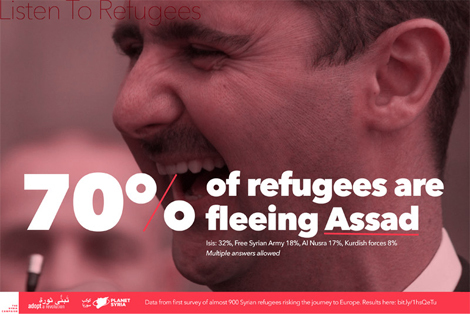 When researchers from the Berlin Social Science Center surveyed Syrian refugees in Germany in September 2015 they found the vast majority were fleeing the violence of the Assad regime. You can’t be pro refugees and at the same time defend the tyrant who causes them to flee. Giving an Assad apologist a platform brings into doubt the aims and legitimacy of this conference. 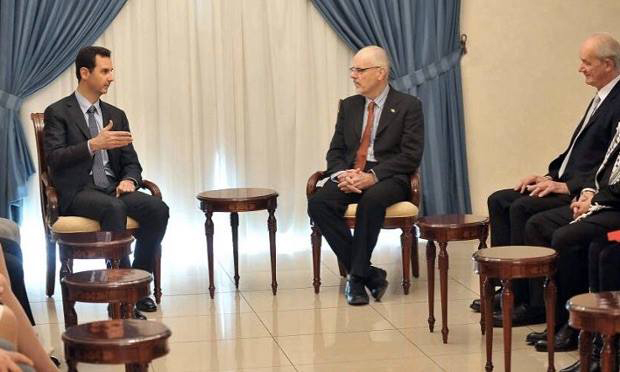 Pro-Assad speakers should not be given a platform at refugee events, and to participate in the conference while Anderson remains a speaker is to be complicit in an attempt to rehabilitate the Assad regime and its supporters. We now call on all other conference participants to withdraw from the Crossing Borders conference. Crossing Borders conference, Lesvos, 7-10th July. Sponsored by Stop the War Coalition (UK), Peoples' Assembly Against Austerity, Real News Network, Stopimperialism.org. To the participants and organisers of the ‘Crossing Borders’ Conference, open letter from Syrian groups in the UK and others, 22 May 2016. Dr. Tim “Asad” Anderson: the abuse of academia to spread out propaganda, by Andrea Glioti, 23 May 2014. Care about refugees? 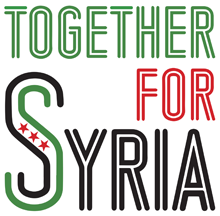 Listen to them: A survey of Syrian refugees in Germany, The Syria Campaign, 9 October 2015. Listen to Syrians. 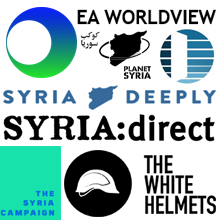 Most of them support Assad against the hateful, sectarian violent opposition. Where i live in a radius of 1km i have 2 refugees centers 1 have nearly 300 ref. And the other also 300 or little more. A lot are eritrean but also syrians. And i cant find 1 that is not flee bcause of assad.all say they lost everything they worked for a d now its gone because the bombs of assad. If you were a refugee trying to get into a NATO allied country, wouldn't you adapt your story to suit their perspectives? If you said that you were fleeing the 'Free Syrian Army' or something, they would accuse you of lying? That said, I am suspicious of Syrians who do not seek shelter in the government held areas if they can, since those areas are the only safe ones in Syria, to my knowledge. Perhaps I should explain that NATO is fabricating excuses for destroying the Syrian economy and Syria itself and getting rid of the president suits that heinous purpose. So, if you need to get out of Syria (perhaps because you cannot get to the government held areas for safety) then you cannot challenge the NATO lies about the Syrian government. I do acknowledge that the Syrian government (popularly reelected by a huge majority in June 2014) like most M.E. governments, has run the country with an iron fist, but that is to be expected when outside forces are constantly breaking up and destroying all the governments around yours, plunging whole countries, like Libya, Iraq, into chaos. There is an extremely good film series on you tube about this with episodes called, 'Does Bashar al Assad really have to go' and 'Has Syrian president killed more than Isis'. We see the same phenomenon of increasing repression in the West now, with the excuse of terrorism. But the terrorism inflicted by the West on Syria is beyond forgiveness. Perhaps I should explain. We know the Assad regime steals the wealth of the Syrian people, and needs mass systematic torture to control the majority of Syrians who want the criminal regime to die. The regime has its paid apologists, but the fake left who babble about anti-imperialism are sick. Tim anderson and all the other assad/russian propagandist should stay away from assad. He and his criminal army are killing day in day out syrians. But sure u only care about assad. These are real people who die everyday and u still support assad. Would love to meet a pro assadist.